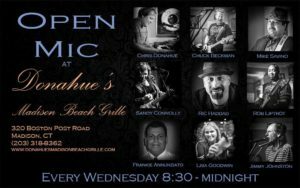 Chris Donahue goes all out every week to provide open mic attendees with a wonderful performing experience. Whether you are a solo act performing an a capella vocal piece, an individual who either sings or plays any instrument and is looking to sit in with a band, a duo with an acoustic guitar and bass, 3/4 of a band looking for others to fill in, or a full band we can accommodate you! People come from all around the state and even out of state to play with these guys! Even so, if you are a solo act, a duo, a trio, or looking to bring your band around, we’ll clear the stage and let you take it. Donahue’s is equipped with a full PA and staffed with a sound guy every week. 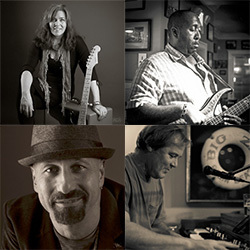 We also have a backline complete with at least one guitar amp (sometimes two – I bring my red Fender Delux Hot Rod), bass amp, drum kit, Hammond B3 with Leslie speaker, and a keyboard. Aside from drums and keys, everyone should bring their own ax. Drummers, please bring sticks! You must write your name on the list with your own hand before 10:00 p.m. to get in the line-up. At least one member of your act must be present to sign up. Sign up on the very next line available. If you’re not ready when it’s your turn, you can wait until you are. Preference is given to early signer uppers. Speed between acts is very important to me. Have your instrument tuned and know what songs you’re going to perform before you walk on stage. If we get to everyone, we’ll start back at the top of the list and work through it again, so if you want to play more, you can sign up again AFTER you play the first time. If you want to be on the mailing list for this event, write your email address on here in your very best 4th grade handwriting. I promise you will only get Sandy Connolly Open Mic notifications.